A good old traditional British pudding! Crumble is another dish with endless possibilities, but rhubarb is in season right now, so why not give this a go? Andrew: I was given some rhubarb by a friend, and a trip to the greengrocer turned up the other fruits, but most of the rest was in the store cupboard. Dawn: Which is just how we operate here at Love Food HQ! Use what you have and what is seasonal, for taste and value. Andrew: The two different sugars enhance the flavour, and the summer fruits added a rich colour. Dawn: Save me some next time! Put the rhubarb and caster sugar in a saucepan on a low heat, the sugar will melt as the rhubarb begins to cook. Drain off the liquid (this is delicious with vodka by the way) and set the rhubarb aside. In another pan, repeat the process with the apple and the brown sugar, and a spoonful of water to stop it sticking. Allow the apple to cook on the outside but stay crisp in the centre. Meanwhile prepare the crumble topping by blitzing the ingredients in a food processor to resemble a breadcrumb texture. If you prefer, you can do this by hand. Rub the ingredients between your fingers. It is more time consuming, but therapeutic. 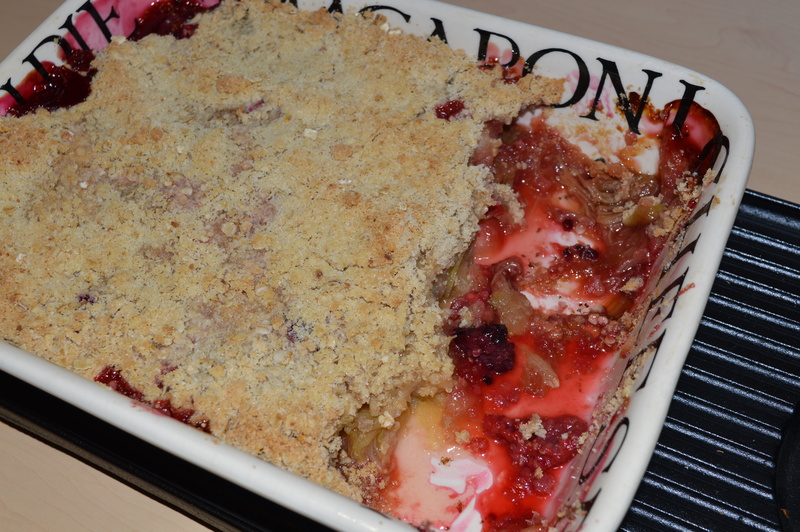 Arrange the rhubarb and apple in an ovenproof dish, and scatter the summer fruits evenly around. Cover with the crumble mixture. Cook for 20-25 minutes at 190ºC/Gas Mark 5, until golden brown. Allow to cool for 5 minutes, and serve with ice cream or custard. Andrew: A great family pudding, for a chilly evening, and a super comfort food! Dawn: You can have seeds and nuts in your crumble topping too! Andrew: If you like your crumbles, make a bigger batch of the topping, and freeze in individual portions for the next time you have a go at this. Dawn: Another time saving tip! For more fabulous recipe ideas, follow forfoodlovers.wordpress.com and our Twitter account @Love_Food_UK. You can find us on Facebook and Mumsnet too. This makes a filling and refreshing breakfast or brunch anytime of the week. Crack open the egg into a medium size bowl, add the milk and beat together until frothy looking. Take the slice of bread and cut into either 2 or 4 pieces. Put each piece of bread in the egg and milk mixture, making sure all the bread is covered. Leave to soak in the mixture for five minutes or until the egg and milk liquid have disappeared and been absorbed into the bread. Put the butter in a non-stick frying pan and melt until it starts to foam (starts to bubble with little air bubbles appearing). With a fork or spoon, pick each piece of bread out of the bowl and transfer them to the hot frying pan. Cook until each side of the bread has turned golden brown. 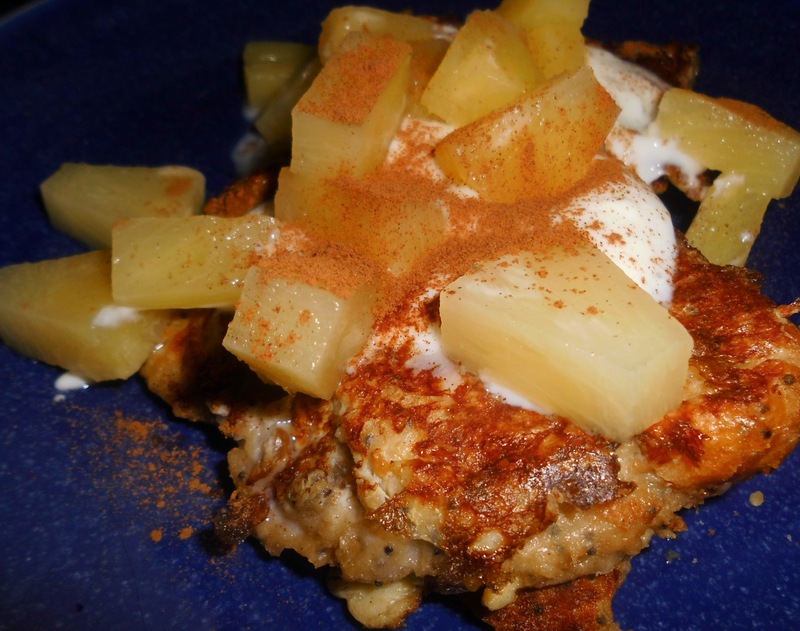 Serve with natural yoghurt and pineapple chunks, sprinkled with ground cinnamon powder. Andrew: Good old fashioned eggy bread! Mmm! Loved that when I was a child! Dawn: However this is a healthier version with the fruit as an addition. Andrew: I would like to try this with blueberries, too. Dawn: Any fruit which is in season is the perfect accompaniment to this simple breakfast. For more recipes, tips and advice from the Cooking Duo, follow this blog and stay tuned to all updates via the Twitter feed @Love_Food_UK. 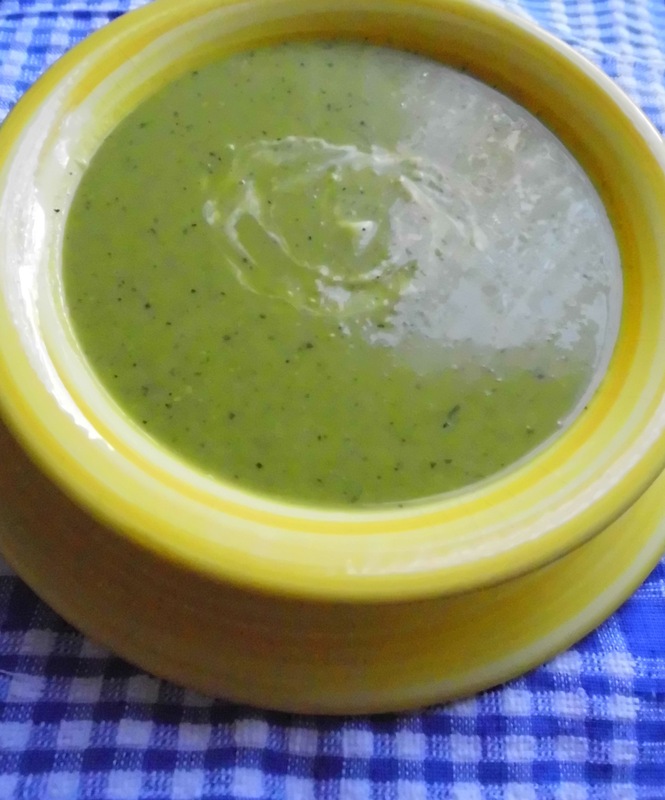 Soup – such a simple, short word that belies the depth of variety and flavours to be had from this liquid food. From light consommé to thick, hearty stews containing delicious chunks of meat and vegetables, soups serve to make wonderful meals and are great for using up leftovers and vegetables close to their sell by dates. Dawn: There’s nothing to beat the taste of a really good, homemade soup and the real benefit of crafting your own is that you know exactly what has gone in to it. Andrew: Yes, and I really like how soups can be served piping hot or chilled – which remind me of Mediterranean holidays! Dawn: Dreaming in the kitchen! Yet that’s the beauty of food: it can transport us to places and times bringing make memories whilst creating new ones. So, let’s press on and create a memorable meal here. Place the onion in a medium sized saucepan and add a little of the vegetable stock. Cook for 5-10 minutes or until the onion starts to become transparent in look. Add the frozen peas and the rest of the stock. Bring to boiling point and then lower the heat to low, to allow the ingredients to simmer. Simmer for 10-15 minutes or until the peas are soft. Test with a fork by prodding a pea or two to test if they are soft. Add the mint and sample the taste. Add seasoning. With a hand held blender, blend the ingredients until all are combined. Serve with warmed, crusty bread. Andrew: Soups can have traditional accompaniments such as croutons and grated cheese that are served with French onion soup as well as ingredients such as cream or yoghurt swirled on top like here. Dawn: Or crispy bacon bits, fresh herbs – even small pasta pieces! You can just about use anything that compliments the main ingredients and enhances a soup’s flavours. You really are only limited by your own imagination! For more imaginatively simple, easy and economically appealing meals and tips, follow this blog – www.forfoodlovers.wordpress.com – and the Cooking Duo’s Twitter account @Love_Food_UK and see you there for a daily new recipe.